Tanganyika Wildlife Park near Goddard, Kansas opened to the public in June of 2008. Prior to that, the Tanganyika Wildlife Park was a private zoo. 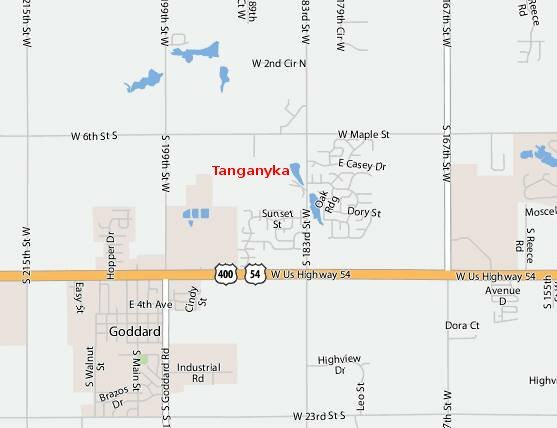 Tanganyika is a non-profit breeding facility for rare and endangered species. Species represented in the park include giraffes, tigers, clouded lepords, black rhinoceros, and zebras. Tanganyika Wildlife Park distinguishes itself from other Kansas zoos by emphasizing interaction between visitors and the animals, There are many opportunities to feed or pet wildlife as diverse as lemurs, camels, birds and snakes. Many of those encounters, such as feeding the giraffes, have additional fees. The general admission listed above includes one encounter. Four additional encounters and photo are availalr for $10, or nine addional encounters and a photo are $20. Tanganyika Wildlife Park is a non-profit breeding facility for rare and endangered species. Tanganyika Wildlife Park is the largest breeder of snow leopards in the world. but Tanganyika was the first zoo where I encountered it. One of two snow leopards (Uncia uncia) born in July 2007 at the Tanganyika Wildlife Park.